While the smart people (a.k.a. the campers) ran from N44 to Foresthill on Saturday of the last weekend of May, I was with a group of 14 nutballs that drove as close to Robinson Flat as we could (about 4 miles). We trudged through 10+ miles of unrunnable snow before we saw the ground. While it was slow going in the deep unconsolidated snow, the day was gorgeous with solid blue skies and a high of 83 in Auburn. When we finally were able to run on bare ground we had been on our feet for over 4 hours. And by the time we got to Foresthill, we had good tired legs for Cal St. Overall, an excellent, but unique Robinson to the River training run. 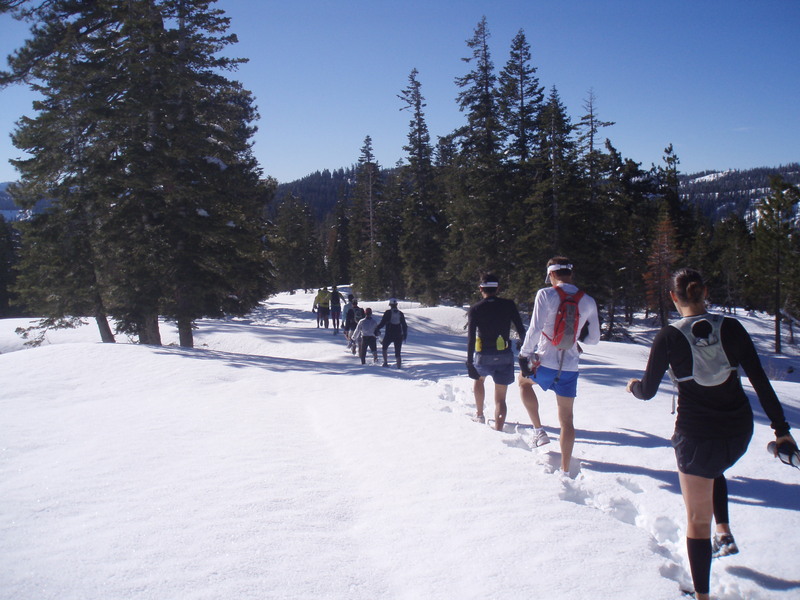 With about 8 feet of snow at Robinson Flat four weeks out from the race, what does that mean for the course this year? Will the alternate snow route have to be used for the fourth time in history? How much snow will we run on? Will we cross the river in boats? The answers to these questions are still unknown as four weeks is a long time, and if the weather is hot and sunny much of the snow will melt. RD Greg Soderlund will keep us informed if an alternate snow route will need to be used, but suffice to say we will be running on snow this year so be prepared for it. The driving consideration for whether we use an alternate snow route (which will likely go down to French Meadows before reaching Lyon’s Ridge then follow the Poppy Trail to Duncan Canyon) is getting aid station supplies to Lyon’s Ridge and Red Star Ridge. If I were a betting man I’d bet El Nino will continue to keep the snow a little longer and we’ll be running to French Meadows on June 26. What do you think? Great post! I am guessing we’ll be going to French Meadows and crossing the river in boats. It’s fun to mix it up every now and then. 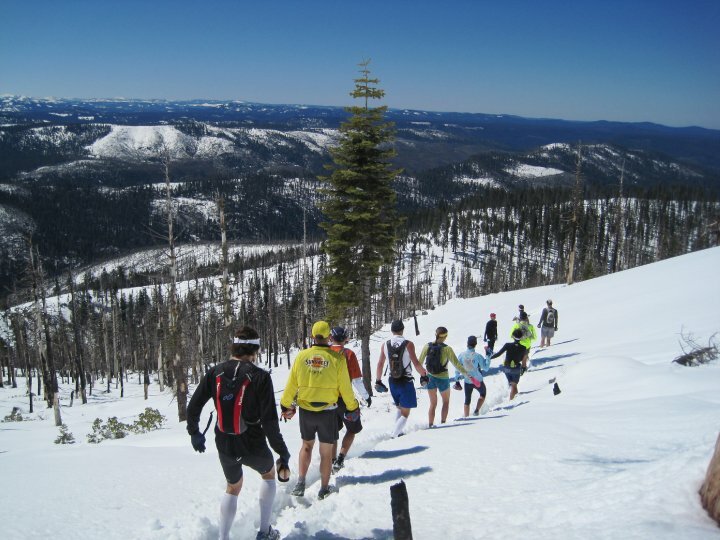 One question, do you know if the snow route makes the entire course shorter? @AJW, If the change is just the upper part, meaning we’ll get to Duncan Canyon AS via French Meadows, Tim says the distance should be the same. If we can’t cross Duncan Creek or get to Robinson Flat then they’ll have to add something to make up the distance. Either way, it sounds like the distance will be 100 miles. Thanks for the pics…I did get to talk to a few of you that did the “SNOW” Route while I went short..from N44 to the river. The heat is supposed to be here next week..I can’t predict the snow route but a boat crossing maybe..With little melt to this point French Meadows can only handle so much so high volume releases should be the norm in my opinion…All out of our control but fun to talk about…see you at squaw. Looks like it was an epic run Craig, great pictures. One question, if they run you guys on the alternate trails wouldn’t it be a faster route? The trail to French Meadows is fast and direct if I remember. If so do you think this could shake things up this year? @Anthony, I don’t know if it will be faster as I’ve never run it. But I think the snow is going to add a interesting element to the race up front. Is Jurek’s CR on the snow route? @weaves, No, not on the snow route, but it was on the Star Fire course used from 2002-2005 which was a little faster course than the current one. See my post on the Ten Best WS Races for a description of all the different courses used. This came to me this morning from the central sierra snowlab at Donner Summit. The winter’s snowfall is about 120 percent of average; snow depth on our study site for June 2 is about 250 percent of average. Snow surveys yesterday at a 7400 foot elevation site had 84 inches on the ground. So, there’s definately going to be some snow in the mountains this summer, most assuredly for your race. How much will melt between now and then is certainly a factor of the weather and therefore a weather forecast. More cool weather is forecast for the next couple days; when and if the big high pressure parks off the California coast, jacking up temperatures, is at this point widely unknown. In summary: my best guess is you’ll have pretty much 100 percent snow cover above 7200 feet on race day. @Bill L, Wow, thanks for the info. I’ve never used screw shoes or any other added traction. Would something like this be advisable on race day? Just wear some shoes with good traction. So, strictly speaking, a pair of shoes would be considered a mechanical aid. Does this mean anybody not bare-footing it is a cheater? @Burningringo, Have you read the book Born To Run yet? I hear bare foot running is all the rage now. 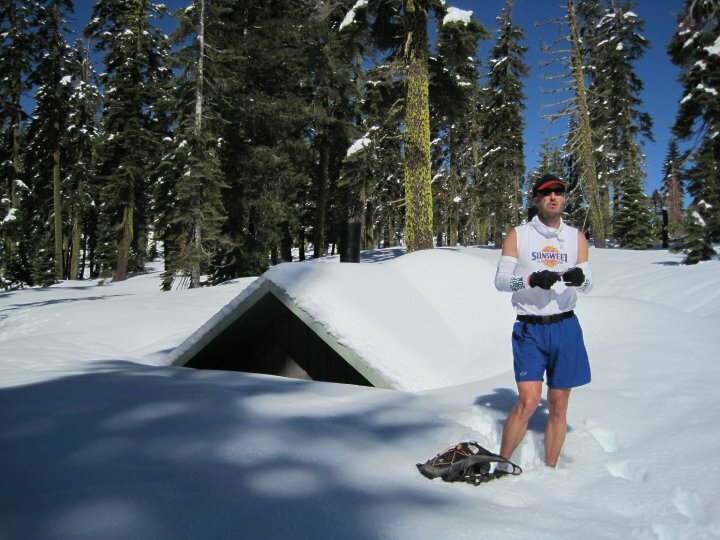 Craig, being the WS veteran you are, can you share any “words of wisdom” for those of us w/o any snow running experience? how much more time should we expect to add, if any, to get to Robinson Flat due to this snow? @Will, I’ve only run in one snow year (2005) on the Star Fire course and it was fast. Happens to be my PR year. Probably lots of factors involved in how it affects your speed. How cold it was the night before, how hot it is, sun cupping, staying on course, can you run on snow or are you falling down, etc. I’m working on a post for next week about weather and snow history, times, finishing rates, etc. Maybe we can glean something out of all that data. @AJW, Did you run barefoot that year? Or was that the year Jurek was so far ahead of 2nd place that Dusty challenged him to a cannon ball contest off No Hands and he still won? Carol gave me the link to your blog. Absolutely fantastic work with so much well written information. Love it. Good luck on WS100 and keep your fingers crossed for PB as he’ll be running on his 72nd birthday (his last bite at the apple, according to him). @Marianne Bush, Thanks! We’ll be rooting for Paul. Speaking of barefoot runners have you heard about the runner who plans to run the race barefoot this year. He started training for his first ultra, that would be this years WS, in March. He’s filming a documentary ‘100 days to Western States’. He ran the course last Saturday, didn’t sign up for the training run of course, ended up talking to all the sweeps and quit at MB, so I heard. He expects the race to let him in because he’s wonderful and if not, he’ll go bandit, so I heard. 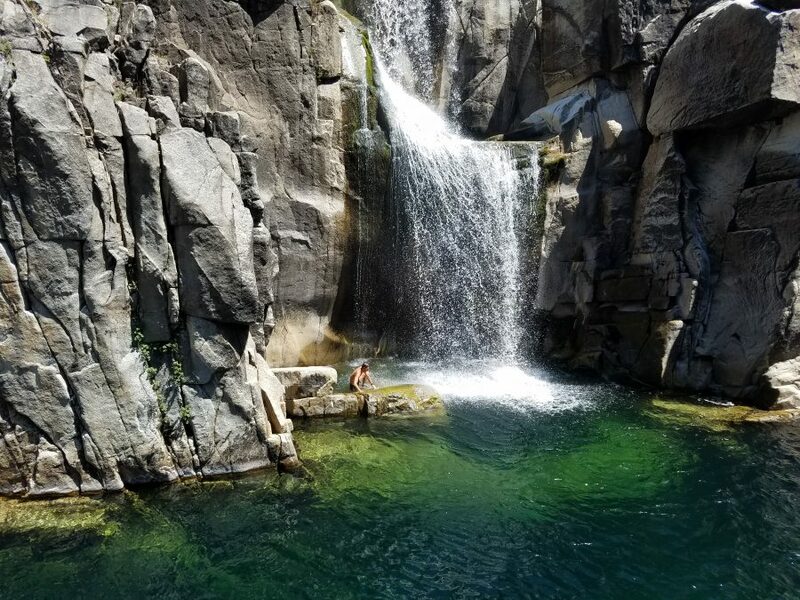 WS100 question – what will be the best source of information (updates) as on WS100 race day? Given the field this year, there is a great deal of interest. @Jim K., the ws webcast is the best source. Live updates all race long. Craig, what do you make of the change from the trail work camp @ Robinson Flat to French Meadows, an alternate “snow route”? @Marianne Bush, I think it just means there was too much snow to camp at Robinson Flat. It’s official that 2010 will be a Snow Year. We’re using the alternate lower elevation French Meadows and Poppy Trail instead of staying on the higher Red Star Ridge route. Mileage is the same when we rejoin the regular course at Duncan Canyon Aid Station. Here’s a map of the snow route.